PPS Founder Fred Kent speaking at one of dozens of placemaking events at the UN's Habitat 3 in Quito. The placemaking movement in 2016 continued its trajectory from a once quiet movement to a global platform to reinvent the way we shape our cities and communities. Bubbling up from every corner of the world and every sector, discipline, and cause, the placemaking movement demonstrated its capacity to provide the common ground between disparate partners necessary to implement the recently enacted "New Urban Agenda," an international agreement to guide the growth of cities for the next 20 years. Jane Jacobs Medal winner PK Das of Mumbai inspired as a placemaking activist at Placemaking Week and Habitat 3. For placemakers, 2016 saw a series of inspirational, global gatherings, amidst growing pressure on our agency as citizens in public space to support democracy. 2016 made it clearer than ever that the future must be increasingly defined by local communities, and it needs to be networked, organized, and resourced to refocus governance, culture and economies around place—at a global scale. 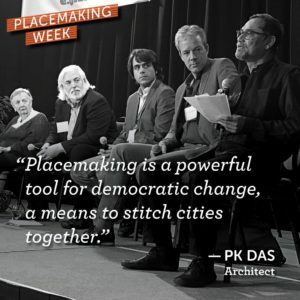 This was the goal of Placemaking Week, which took place in Vancouver, Canada, gathering over 1500 placemakers from 30 countries. Rekindling the energy of the first Habitat conference, which took place in Vancouver in 1976, a year after PPS’s founding, the many voices at the conference began to articulate a set of common values for reframing current discussions of local planning and international development alike around place-led governance and economies. Placemaking Week events included Pro Walk / Pro Bike / Pro Place, a Future of Places Summit, the Placemaking Leadership Forum, the launch of the Digital Placemaking Institute, a convening of Placemaking funders, and an energetic strategic planning session for the Canadian Placemaking movement. 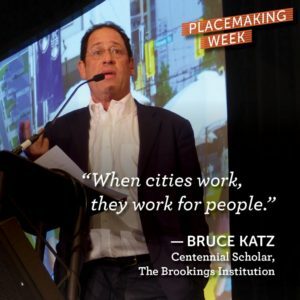 Bruce Katz became our partner in 2016, collaborating to connect the innovation economy and placemaking for more inclusive growth. A month later, Habitat III, the largest UN Conference ever, took place in Quito, where attendees ratified the New Urban Agenda, an agreement charting the growth of cities globally for the next twenty years. This gathering was the culmination of five years of advocacy by Project for Public Spaces, with UN Habitat, and the Future of Places program (including partners from over 100 countries), for the inclusion of public space and placemaking in the New Urban Agenda. The final document includes the spirit of all eight key messages developed by placemakers at the many Future of Places events. Overall, the week was a celebration of public spaces and placemaking and a powerful coming together of global leaders who are passionate about shaping cities around people and places. 2016 also witnessed the formation of the Bass Initiative on Innovation and Placemaking, our collaboration with the Brookings Institution connecting efforts on innovative economies, placemaking, and inclusion. Supporting and integrating with Brookings’ efforts of supporting strong and inclusive innovation economies we are researching models for cities, districts, and main streets to be redefined around inclusive innovation hubs, public space, and place governance. The goal of our fast emerging partnership with Brookings is nothing less than developing the new urban paradigm needed for cities. 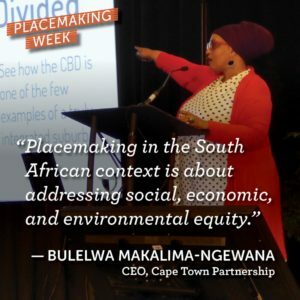 Placemaking Week had a large equity focus. We are applying and expanding examples of this new paradigm through our project work in more than 50 communities at any one time, including places like Pershing Square, campuses of Harvard, Yale, Downtown Eugene, Mexico City’s Parque Mexico, as well in many rural communities through our program managing National Endowment for the Arts’s Citizens Institute for Rural Design, and our partnerships with Main Street America and New Mobility West. Our Heart of the Community program with Southwest Airlines, continues to demonstrate a pioneering model for placemaking philanthropy. Our ongoing campaign to grow the placemaking movement in Australasia continued to thrive with events around Sydney, and a strong presence at Placemaking Week. Our research and communications teams also just released an extensive report of peer-reviewed research and case studies, sponsored by Kaiser Permanente, showing placemaking's power to improve health. The year closed with a powerful demonstration of Placemaking in Nairobi where local PPS partners, including local activists, NGOs, the City of Nairobi and UN Habitat, collaborated on their own Placemaking Week. In the coming year, PPS will focus on building the capacity of regional placemaking networks and global networks around the Placemaking Leadership Council’s Transformative Agendas, with many important, multi-sector regional gatherings being planned in Chile, South Africa, Kenya, India, Asia South Pacific, the Netherlands, and more. Jennifer Keesmaat uses placemkaing as a means to bring everyone into the conversation. After falling between the cracks of many causes, public space and placemaking are being understood as a means to address our many shared challenges more holistically. This year, help us to further grow, connect, and resource the now global placemaking movement. Make a donation to Project for Public Spaces and support our work advancing placemaking around the world. Work with us on a project in your community. 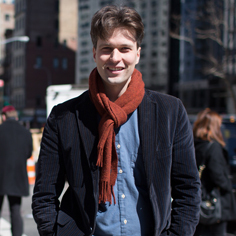 Contact us to discuss our services and experience on all kinds of placemaking projects, trainings and campaigns. Apply to join the Placemaking Leadership Council, and join over 1400 passionate placemaking advocates and practitioners.